Yellow nutsdege (Cyperus esculentus L.) is a warm-season, perennial weed common throughout Louisiana. 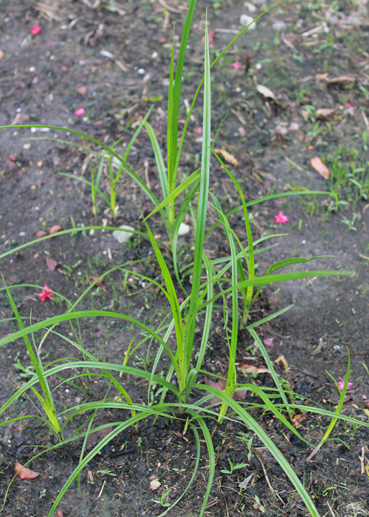 It has leaves that resemble grass; however, it is a member of the sedge family. Yellow nutsdege does produce seeds, but they are rarely viable. Instead it spreads primarily through tubers produced from rhizomes (underground stems). It prefers areas with wet soil and is usually an indicator of poor drainage. Often confused with purple nutsedge, yellow nutsedge can be distinguished by its yellow seed head. Yellow nutsedge has narrow, shiny, grasslike leaves that are bright green in color. Leaves are usually sharply pointed at the tip. Stems are also bright green and are triangular in cross section. Yellow nutsedge produces yellow to light brown inflorescences (clusters of flowers) that extend from the base of the plant on tall stems. Yellow nutsedge produces small white to brown tubers, or nutlets, that grow from the tip of rhizomes (underground stems). For more information on yellow nutsedge identification and characterization, visit the USDA Plants Database at https://plants.usda.gov. The best way to prevent or reduce weed encroachment is to maintain a healthy lawn through proper fertilization and soil pH and regular mowing. Properly maintaining a lawn through these cultural practices promotes dense and vigorous turfgrass, allowing it to better compete with weeds. Below are the recommended mowing heights and nitrogen fertility rates recommended per turfgrass species. Yellow nutsedge thrives in poorly drained or overwatered areas.In excessively wet areas, surface and subsurface drainage may be necessary. Irrigation may need to be reduced or eliminated in chronically wet areas. In addition to cultural practices, herbicide applications may be required to achieve effective weed control. There are several preemergence and postemergence herbicide options available for yellow nutsedge control. Preemergence herbicides will suppress yellow nutsedge. However, post-emergence herbicides are more heavily relied upon, but multiple applications are often required throughout the growing season, especially during wet springs and summers.